For some, Mobility Field Day 1 may be a distant memory. The first Mobility Field Day Cisco brought Cisco to the delegates to talk about CMX Cloud. 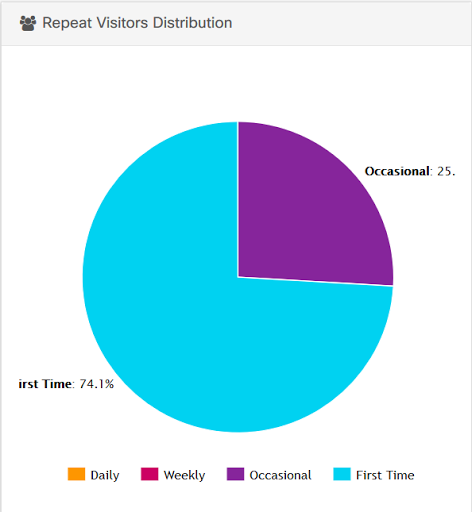 Simply taking presence analytics to the cloud wasn’t all that interesting to me. Prior to 8.3 code you needed a proxy server to convert the NMSP data from the controller to an HTTPS connection to the CMX server in the cloud. This was a bummer for me because now I have to deploy a server to run the proxy on, as well as a WLC to connect to CMX. And if I’m deploying a server infrastructure at a site, why not just run CMX locally? But not all was lost, Cisco told us the plan was for 8.3 to support a native connection to CMX cloud. So that removes the server requirement, but what about the WLC? They also announced that Mobility Express (the WLC software running on an AP) would support this direct connection to CMX Cloud in 8.3, removing the requirement to have a physical WLC and controller licensing for this deployment. This is great news for distributed organizations like retail that want to gain presence analytics, but are shy about either deploying gear locally, or building/leveraging their WAN circuits for this. Fast forward to today and 8.3 code for Mobility Express is published on Cisco.com. I was asked to build a CMX demo for the upcoming Interface Boise conference in a few weeks, so I decided what a great opportunity to try out CMX Cloud with Mobility Express. In just a few minutes I had reset my 1832 AP running Mobility Express and run through the initial setup. A reboot later and the Mobility Express AP was up and operational. Now for the CMX Cloud component. I signed up for a CMX Cloud trial at cmxcisco.com. It warns you that it can take up to a day to receive your account info. Less than an hour later, I had my login credentials, server url and authentication token. 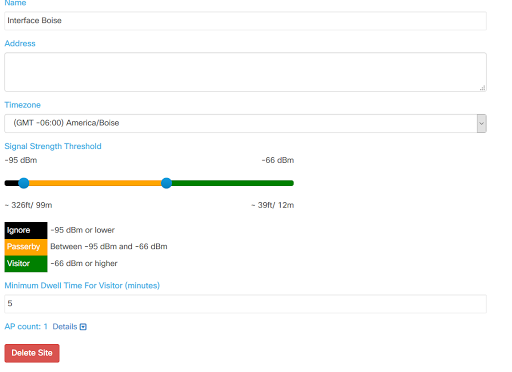 Going to the Mobility Express GUI, I was able to configure this with a minimal effort. *Note: I ran into an issue where during the Mobility Express initial setup, DNS was listed as optional. When you setup CMX, it NEEDS the DNS server functional to resolve the CMX server URL and to build the needed ACLs for the CMX Connect functionality. You can configure DNS on the CLI of the Mobility Express if you don’t want reset the AP and rerun the setup. Once DNS was setup, the CMX configuration on the AP worked flawlessly. If you’re familiar with CMX Presence, the setup of CMX Cloud for presence is quite straight forward. First you create a site and add your AP to CMX. Remember it’s the base radio MAC, not the ethernet MAC. 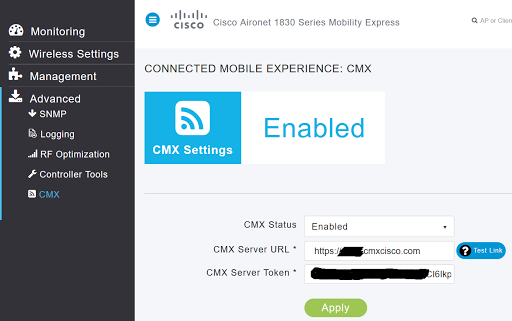 Once you have the site created and the AP added to the site, I verified that I saw the Mobility Express controller connected to CMX and that I started to receive data. Now that the AP is talking to CMX Cloud, for the next part all I had to do was wait (for data to populate). The AP was running at my desk in the CompuNet Meridian office. 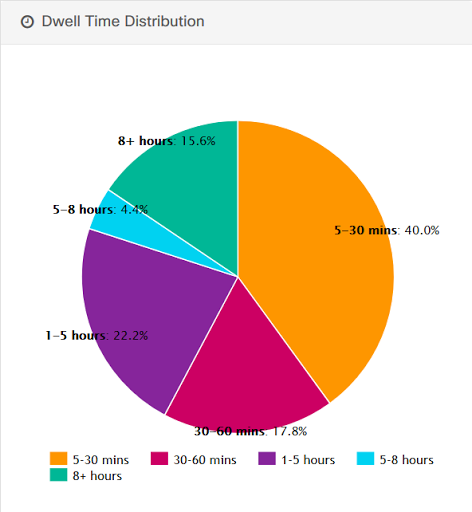 Pretty quickly i started to see the Insights panes starting to get populated. I found the insights pretty interesting. Our local engineering team is still edged out on Intel PCs vs Macs, but it’s close (51 to 46 in the last 7 days). I did find it interesting that 12-1 was he peak hour, considering the number of people who go out for lunch. All things considered, this solution looks really well thought out, easy to deploy and simple from the fact that the only hardware required on-site is the Mobility Express AP. I’m also really interested to see what this data looks like for the day of the conference (which is the whole point of the demo). For the future, I think having location as part of this offering would be cool. However, I think that the need to have maps in Prime Infrastructure and sync that to CMX might be more cumbersome and really take away from the minimal hardware needed. Maybe this is an opportunity for Prime Infrastructure in the cloud (Or a “Prime Lite” in the cloud). I also like the fact that I don’t have to manage the box. It has been exceptionally stable and not having to update it periodically exemplifies why this belongs in the cloud. This is really attractive when you realize that Cisco markets this to non-IT folks. IT Doesn’t have to support it aside from 3 lines of config in the Mobility Express AP, and the rest can be managed by the marketing or BI folks. It should be noted that Cisco provided me with the 1832 access point as part of participating in previous Wireless Field Day activities. The CMX Cloud was provided by Cisco as part of a 60 day trial. Next Post: Why validation surveys aren’t enough, the importance of functional validation testing.